There are a lot of fascinating things to know about your horse's bones. With Halloween right around the corner, maybe you have thoughts of zombie horse hoards crossing your pastures during a full moon. No? Perhaps you have nightmares that all the carrots you’ve ever sacrificed to your horse’s chompers are now back for revenge. Not really? Well, even if the scariest thing about your barn is all the stalls you have to clean, here’s a Halloween-themed anatomy lesson: your horse’s skeleton is way cooler than you might think. Here’s why. 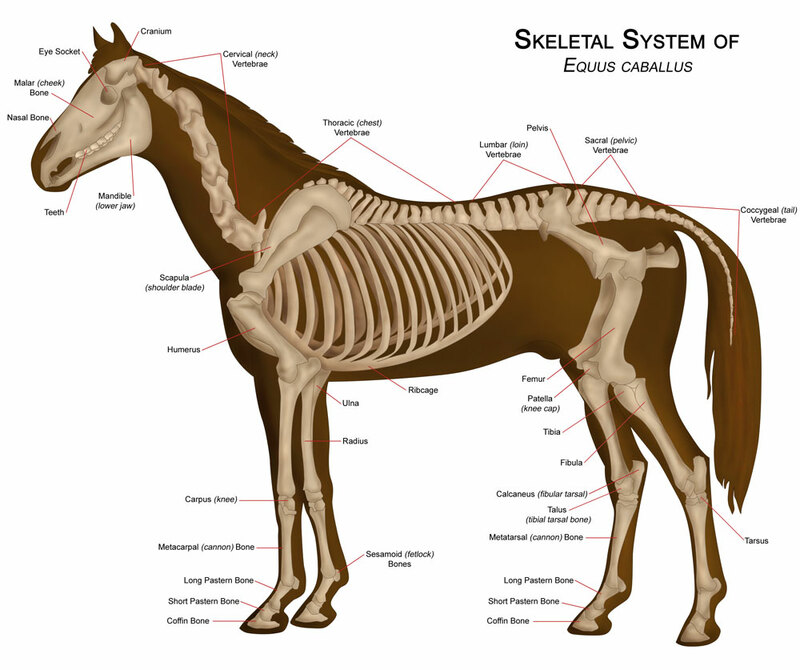 Most horses have 205 bones in their skeleton but this can vary across some breeds. Arabians, for example, can have fewer bones in their spinal column. And while most horses have 18 ribs, because some Arabians’ thoracic spinal column is shorter, this breed may only have 17 ribs. Eight of these ribs—for all breeds—are considered “true ribs”, meaning they completely connect between the spinal column and the sternum. The remaining ribs are called “floating” because they do not reach all the way to the sternum. The withers of your horse are actually the spiny vertical tops of the thoracic vertebrae. On a skeleton, they appear long and narrow and a horse’s heavily muscled back shapes them into the more comfortable saddle-sitting area we know on a live horse. Most horse lovers are aware of the amazing structure of a horse’s hooves: the coffin bone, also called P3 which is short for the third phalanx, sits inside the hoof capsule, suspended by delicate, Velcro-like soft tissue called the laminae. This coffin bone is synonymous with the tip of a human’s middle finger, meaning your horse literally stands on the tip of one toe. The remaining “fingers” have long since faded away with the evolution of the horse, but the split bones along the cannon bone are vestigial remnants of the second and fourth fingers. Horses don’t have a collarbone, also known as the clavicle. A horse’s knee in his front legs is called the carpus and is analogous to our wrist. Understandably complex, this joint in the horse is made of two rows consisting of three primary bones each. Sometimes, a very small “extra” bone is present in the carpus. This has no purpose and causes no problems but can sometimes be confused for a chip fracture on an x-ray. Talk of navicular bones sometimes breeds fear in the heart of horse owners. This pesky miniature bone buried deep in the hoof behind the coffin bone is the source of a frustrating and sometimes career-ending condition in horses called navicular syndrome. Navicular means “boat-shaped” but this term comes from the human navicular bone’s concave surface as it is wedged in the foot right in front of the ankle. In horses, the navicular bone is in a different location and is actually a sesamoid bone, analogous to the tiny bones that sit underneath our toes at the balls of our feet. Lastly, it’s no joking matter. While sometimes hotly debated in barns across the country, the science just doesn’t support it: horses lack a funny bone.